Each chapter starts in the military with James becoming accustomed to what is undeniably a bleak life. Even still, Herriot finds something amusing in everything and his tales of torturous training sessions, crazy sergeants, and extreme (and seemingly pointless) drill routines shows the usual tongue and cheek verve that keeps readers chuckling throughout the series. Nevertheless, we’re still longing with James to be back in the comfort of the Dales, tending the animals and enjoying the liveliness of Skeldale house. This isn’t just because of the first two books either (although, by now, we have certainly established ourselves as a part of this world). James evokes his own homesickness in a way that is heartbreakingly British – chin-up and stiff-upper lip all the way while everything around him from the dust motes floating in the air bring back memories of a place and life he longs for. These memories, as it were, serve as James’ life preserver and the instigator to go back-in-time, spinning more vet adventure yarns for the readers. 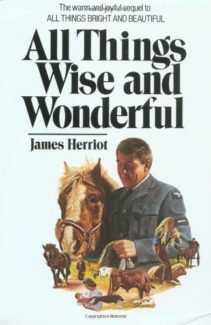 All Things Wise and Wonderful contains hilarious and poignant stories of both the new people in Herriot’s life at the Barracks and his clientele back home. The continual gassy emanations from his non-embarrassed airmen remind him of the unfortunate instance of Mrs. Pomphrey’s brief stint owning a bulldog with an excessive flatus problem – one of the most hilarious moments in the book and most memorable moments in the television series. James experiences his own encounters, this time as the patient when the army sends him off to “The Butcher” to get some much-needed dental work. This reminds him of his own methods of pulling teeth – on horses . . . except his equine patients had a much better experience! There’s more time with Tristian, Siegfried’s young, partier brother who always manages to get in the most terrible scrapes. This time we have everything from dates shoved out the window (in an effort to hide from Siegfried that he wasn’t studying for exams), an unfortunate series of practical jokes played on a current girlfriend’s unwitting father, and Tristian’s memorable stint as the housekeeper and (most unfortunately) cook. James pauses the reminiscence to kick-back into his usual real-time narration mode which takes us away from the warm-fuzzies of memory and puts the tension back in the now. Helen is soon to deliver and James has a terrible premonition/fear. Going AWOL through a series of misadventures, one including marching along with another platoon, James risks everything to go back home for the birth of his child in an especially endearing and tear-jerking, edge-of-the-seat adventure that is a perfect example of why this open-hearted autobiographical series is so touching and beloved today. Along the way, as the barracks becomes a center of lung infection and depression and James’ crazed flight teacher screams in his ear, Herriot remembers the successes and the heartbreaking failures: the cat who died of cancer on Christmas after delivering her kitten to a safe and loving home; the emergency road-side resuscitation of a Golden Retriever asphyxiating on a rubber ball; the miraculous recovery of a mauled and mutilated dog brought back to life (and a good owner); the adventures of a cat meant for death who instead lives and loves with the Herriot’s – while also attending all village meetings and get togethers; and much more ranging from horrific epidemics of foot-and-mouth to simple stories that revealed the strength and hardship of life and learning. Finally, in the conclusion, James is discharged, and heading back to his life. Readers breath a sigh of relief that James’ military days are over and his return to Skeldale imminent. All Things Wise and Wonderful has, as usual, been an experience of both melancholy and happiness, a loving portrait of life, and a steadfast story companion. The real-time verve of James’ innocence and growing into his practice, however, has been interrupted by the “memories” narrative, caused by the shadow of war and the hardship of separation and rejection. We’re more than ready to see our favorite vet back in his element with Helen, Siegfried, Tristan, and the lovable, laughable entourage of Darrowby. Yet, despite the bittersweet tinge overlaying this offering in the series, it’s a crucial turning point and readers are honored that Herriot, like the hardworking Dales people, has taken it all in stride and opened up this tender moment in his life, giving the complete story. I can’t wait to start on the next Herriot book!